Teflon is called for when excellent release properties are required, or when high heat or chemical resistance is mandatory. Canadian Motivel Inc. distributes and converts the finest teflon fabric on the market. Specialty cut-to-length pieces of fabric is available. We also die cut specialty parts for your most demanding appllications. 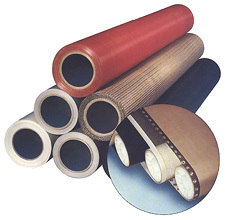 Also, take a look at the Teflon Tapes we offer.